Three small ammonite fossils, each approximately 1.5 cm across. A fossil of a trilobite which lived about 444 million years ago. Lower Proterozoic stromatolites from Bolivia, South America. These were produced by cyanobacteria. 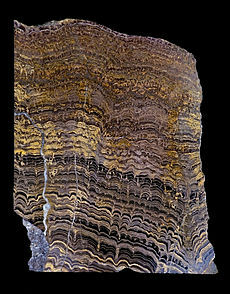 Polished vertical slice through rock. Fossil locust from the earliest Upper Cretaceous, ~95 million years ago, Santana Formation, Brazil. A fossil is the remains or trace of an ancient living thing. Fossils of animals, plants or protists occur in sedimentary rock. In a typical fossil, the body form is retained, but the original molecules that made up the body have been replaced by some inorganic material, such as calcium carbonate (CaCO3) or silica (SiO2). The fossil feels like, and is, made of rock. It has been mineralised or petrified (literally, turned into rock). A fossil may also be an imprint or impression of a living thing remaining in the fossilised mud of a long-gone age. Some organisms fossilise well, others do not. The most common fossils are those left behind by organisms that produce hard materials. The hard, calcitic shells of molluscs (such as clams and snails) and of now-rare brachiopods (also known as lampshells) are examples. These sea-dwelling shellfish have produced many fossiliferous (that is, fossil-bearing) chalky layers of limestone in the earth. Soft-bodied organisms can fossilise in special circumstances: the Ediacaran biota is a good example. The best-known fossils for the general public are those of the giant, prehistoric dinosaurs. The fossilized bones and fossilized tracks of these huge, ancient reptiles can be seen in many museums of natural history and earth science. The study of fossils by geologists and biologists is known as paleontology. If the study puts living things in their ecological context it is called paleobiology. There are some sites where fossils have been found with remarkable details, or in large numbers. Palaeontologists call these sites Lagerstätten, which means, in German, 'storage place'. Microscopic or very tiny fossils are called "microfossils"; while larger, macroscopic fossils — such as those of seashells and mammals — are called "macrofossils". Natural stones which look like fossilized organisms, but are not fossils at all, are called "pseudofossils". Indirect evidence of prehistoric life — such as a worm's trail or an animal's footprint — is known as a trace fossil. Fossilized excrement, faeces or dung is known as a coprolite. Chemical traces of prehistoric organisms is called a chemofossil. Objects made by prehistoric people are called artifacts. Even when the remains of soft-bodied animals are gone, there may be impressions, molds or carbon traces which remain permanently. So, in special cases, we do have fossils even of small, soft invertebrate animals. Sometimes a fossil is produced as a result of dryness (desiccation), freezing, or pine resin. Mummified animals, ice-covered wooly mammoths, and insect-filled amber are examples of such fossils. Living fossils, however, are not fossils at all. Instead, they are modern-day organisms which very closely resemble their prehistoric ancestors of many millions of years ago. The ginkgo tree, the coelacanth and the horseshoe crab are good examples. These ideas were rediscovered in the 17th century in Europe. Nicolas Steno in the Netherlands and Robert Hooke at the Royal Society in London both wrote and gave lectures about fossils. In the 18th century fossil-collecting began, and serious thinking on geology began to make progress. In the 19th century geology became a modern science, and fossils played a part in the theory of evolution. ↑ Fossil: the remains or impression of a prehistoric plant or animal, usually petrified (turned into stone) while embedded in rock". Concise Oxford Dictionary, 9th ed. ↑ Levin, Harold. 2006. The Earth though time. 8th ed, Wiley N.Y. Chapter 6, p117. ↑ Guthrie W.K.C. 1962. A history of Greek philosophy. vol 1: The earlier presocratics and the pythagoreans. Cambridge. This page was last changed on 28 October 2014, at 06:22.